Behind every fighting man in France and elsewhere there was a veritable army of men and women at home doing their bit for King and Country. This took many guises, some worked in War factories, some on the land , down the pit. Others engaged in fundraising or caring for the welfare of the troops at the front and when they returned home injured and vulnerable. The redoubtable Mr Fowler , the headmaster of Newbattle School was a avid patriot, raising large quantities of money and sending huge amounts of cigarettes to the front, Newbattle School raised so much money that after the war they were presented with a captured German Mauser rifle, I shudder to think of that happening nowadays. The clippings and stories that folow will hopefully give an idea of this effort. I thought I would take the liberty of starting with my Grandmother Janet Gibson who was involved with Red Cross work. Here is a copy of a letter received by my Granny from Pte William McNab 6267 KOSB, I'm delighted to say that William McNab survived the war unlike so many of his comrades. And here on a day out with wounded soldiers in their 'Hospital Blues' issued to them in order that they are immediately recognised as wounded soldiers. 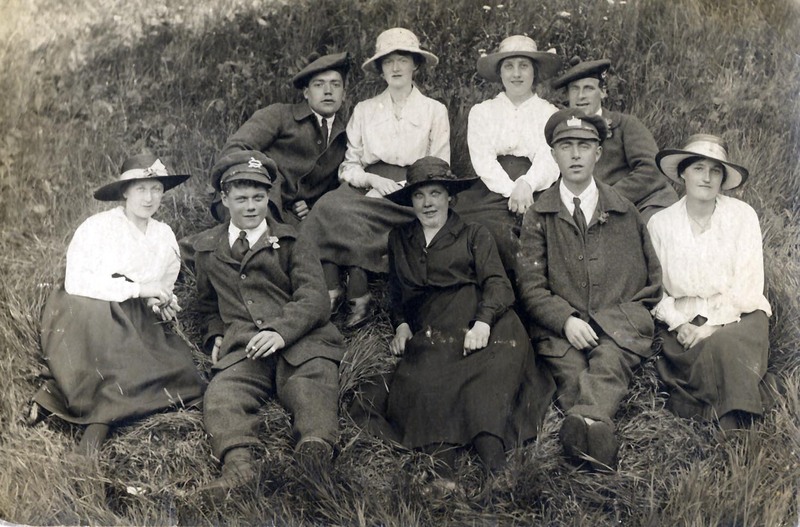 The two lads with service caps appear to be from English regiments, my Granny is front row extreme right.